More than 8 lakh beneficiaries have been admitted to empanelled hospitals and claims worth Rs 662 Cr have been settled. New Delhi: Defence Minister Nirmala Sitharaman has termed it unfortunate that some states have chosen to opt out of the Centre’s ambitious Ayushman Bharat scheme for “political expediency”. She added that once fully implemented, Ayushman Bharat – which is also known as PM-JAY or Pradhanmantri Jan Aarogya Yojana – will become world’s largest fully government-financed health protection scheme. On January 10, West Bengal Chief Minister Mamata Banerjee had announced that the state was pulling out of the scheme, accusing the Narendra Modi-led NDA government of “playing dirty politics” under the garb of the health coverage programme. “You(Narendra Modi) are sending letters with your photograph on them to every household in the state, making tall claims to take credit for the scheme. Then why should I bear 40 percent? 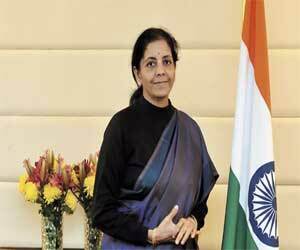 The NDA government should take the entire responsibility,” she had said. “More than 8 lakh beneficiaries have been admitted to empanelled hospitals and claims worth Rs 662 Cr have been settled. Within 100 days of its launch, it has been lauded by organisations like WHO and independent philanthropists like Bill Gates,” Sitharaman wrote on Facebook.